Bliska Wola - Flats and houses - J.W. Construction Holding S.A.
We provide spaces for offices, shops, cafes, a kindergarten, a large park with a fountain and leisure terrains. We offer comfortable apartments with the areas ranging from 23,74 to 111,30 sq. m. Modern, elegant design. Apartments in the ground floor are available with gardens. Apartments in the city center of Warsaw at Kasprzaka street close to the E. Szymanski Park and the Sowinski Park. The Bliska Wola residential project denotes the comfort of everyday living in a perfect location as well as a friendly place for families. 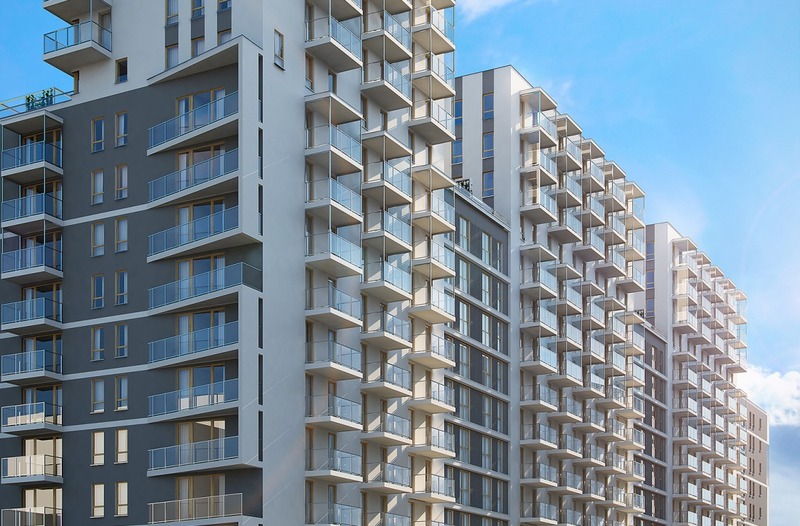 Bliska Wola denotes the convenience of living in the close proximity of the city center with any amenities offered by modern design solutions. This residential complex provides office spaces, shops, cafes, a kindergarten, a large park with a fountain and leisure terrains. At your fingertips there are storing rooms, spaces meant for storing baby carriages and bicycles, parking places in the underground garage and gardens for apartments in the ground floor. This location guarantees its dwellers a quick access to the city center as well as a possibility of taking advantage of the rich city transit system. It will take children only a few minutes to walk to the nearest school or kindergarten. Investment advisor Bliska Wola they are at your disposal!